Every day was a photo walk. The next thing you know, a year or two later, I’ve got a few thousand photos of the quirky buildings and people of Midtown Manhattan. You may have another name for it, but I call it ‘snapshot photography’. It’s simply walking around with a camera and snapping whatever catches my eye. It’s not quite the level of street photography, which I think has a higher level of planning. A lot of street photographers will set up and take one great shot or the same shot with different exposures or lenses. They may stake their spot for hours or months until the light is perfect, the shadows in line and that pedestrian, dog, or fly walks into view. With snapshot photography, to me, it’s more of an in-the-moment shot. The snapshots are happenstance. I like odd and cute things, but also the ordinary when it calls my lens. For ten years I worked on the Jersey City waterfront facing Lower Manhattan. At lunch I’d walk the riverside or set off in the direction of an unknown neighborhood. Some of my favorite early snapshots (on film with my Olympus OM-1) are of cranes. Not bird cranes, but building cranes as the decade proved to be a building boom. As the years went on, I began to carry my various digital cameras with me as I explored the old and new of the city. Well, the next thing you know, I’ve got a few thousand photos of the city’s decay and rebirth. My offices moved to the News Corp. building in Times Square. My fifteen-minute walk each way proved a boon to my snapshot library. That same mile-or-so walk held many various routes, and the thousands of commuters battling tourists for a chunk of sidewalk always piqued my eye! Later I began walking around my town. The homes and buildings look much altered when you walk along with a camera rather than race past in a car. One two-hour walk in July I walked and walked and snapped photos of flags on houses, in gardens and on windsocks. Other days my hometown photo walk resulted in snapshots of street signs. Okay, so most of these snapshots may not win awards, it was the walking and snapping that was the most fun. Sorting through a day’s worth of snapshots is as much fun as the shoe leather photography itself. My most recent photo walk was a snapshot adventure with my daughter through Harrison, New Jersey. The former industrial town, known for having the most bars within its city limits, is transitioning those former factories into luxury homes with upscale dining and shopping. We were able to find churches, and repurposed buildings from the 1800s. And just a few blocks away the old firetrap PATH commuter station is being replaced with a state of the art terminal. And nearly all of that is a healthy walk to the Red Bull Arena. A couple hours with my daughter showing me the town and seven hundred photos later, and I’m a happy snap-shooter! Sure, a lot of duplicates and blurred shots got deleted. It’s digital, not film. We saved some and others need their art drawn out with cropping. I don’t use a lot of photo tricks, but sometimes the photo I got wasn’t the one I thought I got. Sometimes it’s better. Those are keepers. 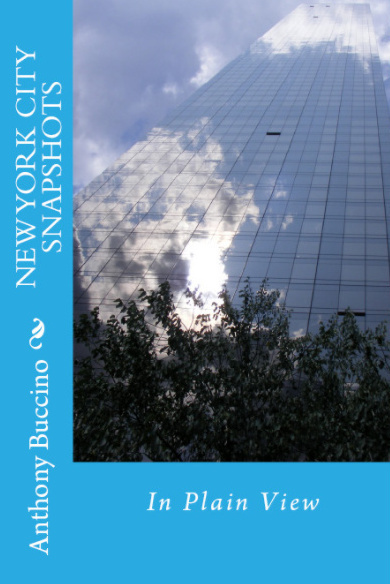 In selecting from the thousands of photos available for my three collections, Jersey City Snapshots (2012), Nutley Snapshots in Plain View (2017), New York City Snapshots in Plain View (2018), I selected my favorites. The books may not sell more than a few copies, the snapshots may not be your favorites, and they may never win photo competitions, but there is something in each selected photo or grouping that speaks to me.